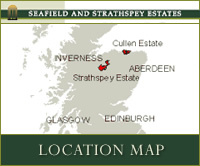 Seafield and Strathspey Estates are committed to the principles of good management, conservation and maintaining positive relations with our local communities. With a cohesive plan and forward thinking outlook, the Estates have embraced the role they play in future energy solutions, tourism, education, rural accommodation, agriculture, protecting the environment and as employment providers. The management are aware that well run estates have an important part to play in the fabric of rural Scotland and its future prosperity. Today, more than ever before, policy statements are issued by most trade associations and organisations, and Seafield and Strathspey Estates, as a modern family run business are no exception. The Estates either conform to or are working towards implementation of high standards and guidelines issued by Scottish Land & Estates, Wildlife Estates, Scottish Quality Farm Assured Cereals, UK Forestry Standard and others. Seafield and Strathspey Estates recognise the employment resource as one of their major assets and give high priority to Health and Safety issues and the provision of a Group Personal Pension Scheme to provide for employees after their service years. The Estates now have a corporate management structure managing all business interests. Management employees are jointly employed by the principals, and service their requirements as if they were personal clients. Each member of the management team is highly skilled. Co-ordination, co-operation and information dispersal are achieved laterally within the management structure by regular meetings involving senior staff from all disciplines. The Estates' objectives include responsibility for people, business, property, land, community, heritage, wildlife, environment and safety. The following sets out our list of policy objectives for management and corporate social responsibility. Click on the links to expand. The Earl has spent his adult life managing the family estates. Educated at Eton, as Viscount Reidhaven, he was introduced into estate management well before the death of the Late Countess of Seafield in 1969. The Earl and Countess live at Old Cullen in Banffshire where Lord Seafield is very active in the management of the estate. His flexible approach and constant contact with estate employees and advisors allow the estate to be dynamic and decisions to be made rapidly. Lord Reidhaven was educated at Harrow. He has been connected with the music industry and lives largely in Kent. He is a trustee of The Reidhaven Trust. Lord Seafield's younger son was educated at Eton. He has a degree in Psychology from Edinburgh University, and has been employed in business management in the entertainment industry in London, estate management in Scotland and has a particular interest in renewable energy on an international scale. With a strong commitment to the family estates, he lives in London but spends considerable time at Strathspey throughout the year. 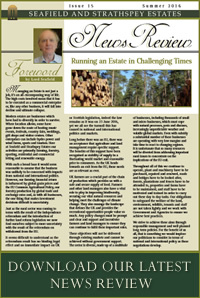 Will Anderson is a Chartered Forester with over 30 years experience in forestry and land management, mostly in the north and northeast of Scotland. He started as a contractor before attending forestry college and qualifying in 1989. Prior to joining Seafield & Strathspey Estates, Will worked on the Glenlivet Estate and was a forestry manager and forestry consultant for two firms of chartered surveyors. He has held the position of Forestry Director at Seafield & Strathspey Estates since 2007. 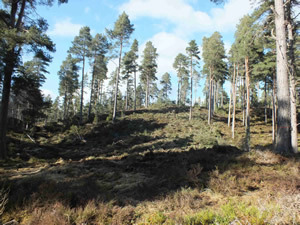 Also involved in forestry industry representation, he holds several committee posts including a Confor directorship and acting as their North Scotland Regional Chairman. David originally studied Agriculture at the Scottish Agricultural College before going on to study Land Economy at Aberdeen University and qualifying as a Member of the RICS in 1998. His early career was spent with a prominent firm of land agents in the north of Scotland before taking resident land agent positions on two of Scotland’s larger landed estates and ultimately joining Seafield Estate in 2016. During his career he has held a number of external positions on landowner/farmer representative bodies and land management forums. he is responsible for all land and property matters including the management of the family farming operation and sporting.